There are many different variations of sweet potato tagine on the internet, but this one is sweetened naturally with spices like cinnamon, ginger, cloves, and fresh dates. It’s bound to be your new comfort, go-to-meal especially as the summer heat passes. Serve it over whole grains, such as brown rice or quinoa for a complete meal. For those of you unfamiliar with tagine, it’s essentially just the name given for stews in Northern Africa. Tagine is the kind of cookware the stews are typically prepare in. Wash all of the produce. Dice the onion, sweet potatoes,and zucchini. Mince the garlic. Remove the pits from the dates, and chop into small pieces. In a pan, sauté the garlic. Then add in the onion and sweet potato. Once the onion and sweet potato start to cook down, add the zucchini and the date pieces. (* to sauté without oil, keep a glass of water on the counter near the stove and add more water as needed while cooking. Add a small amount at a time to avoid making the veggies soggy). 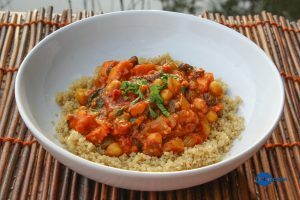 Once the veggies are cooked to a desire texture, add the raisins chickpeas, tomato paste, spices, tomatoes, and water. Stir the mixture well and allow to simmer on medium heat. Continue stirring to avoid burning. In a sauce pan, combine 2 cups water with 1 cup quinoa. Bring to a boil and then reduce the heat. Cook the quinoa for ~15 minutes or until soft. 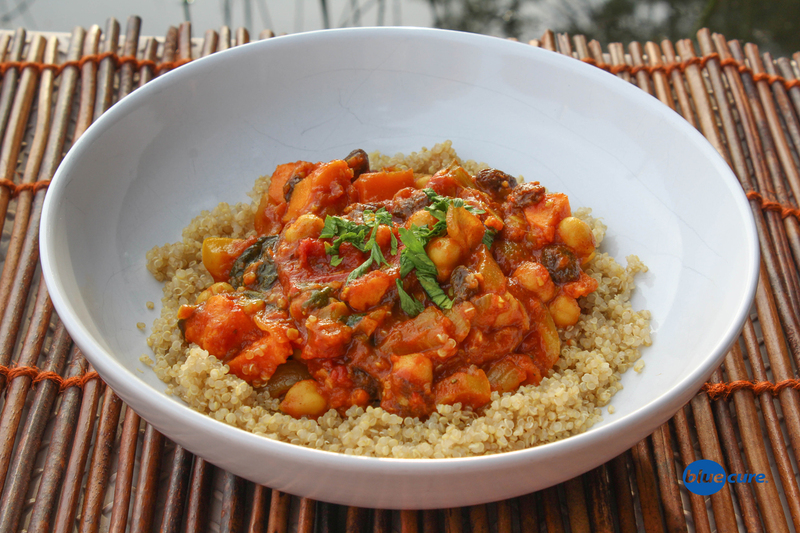 In bowls, serve the sweet potato tagine over the quinoa. Top with fresh cilantro or parsley, and enjoy.